Mirror movements (MRMV) are involuntary movements on one side of the body that mirror voluntary movements on the opposite side. Congenital mirror movement disorder is a rare, typically autosomal-dominant disorder, although it has been suspected that some sporadic cases may be due to recessive inheritance. Using a linkage analysis and a candidate gene approach, two genes have been implicated in congenital MRMV disorder to date: DCC on 18q21.2 (MRMV1), which encodes a netrin receptor, and RAD51 on 15q15.1 (MRMV2), which is involved in the maintenance of genomic integrity. Here, we describe a large consanguineous Pakistani family with 11 cases of congenital MRMV disorder reported across five generations, with autosomal recessive inheritance likely. Sanger sequencing of DCC and RAD51 did not identify a mutation. 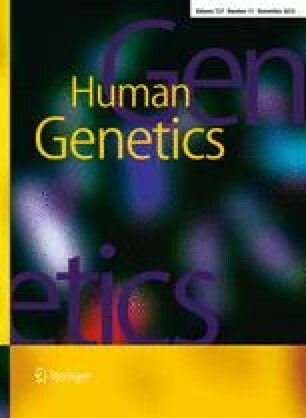 We then employed microarray genotyping and autozygosity mapping to identify a shared region of homozygosity-by-descent among the affected individuals. We identified a large autozygous region of ~3.3 Mb on chromosome 22q13.1 (Chr22:36605976−39904648). We used Sanger sequencing to exclude several candidate genes within this region, including DMC1 and NPTXR. Whole exome sequencing was employed, and identified a splice site mutation in the dynein axonemal light chain 4 gene, DNAL4. This splice site change leads to skipping of exon 3, and omission of 28 amino acids from DNAL4 protein. Linkage analysis using Simwalk2 gives a maximum Lod score of 6.197 at this locus. Whether or how DNAL4 function may relate to the function of DCC or RAD51 is not known. Also, there is no suggestion of primary ciliary dyskinesis, situs inversus, or defective sperm in affected family members, which might be anticipated given a putative role for DNAL4 in axonemal-based dynein complexes. We suggest that DNAL4 plays a role in the cytoplasmic dynein complex for netrin-1-directed retrograde transport, and in commissural neurons of the corpus callosum in particular. This, in turn, could lead to faulty cross-brain wiring, resulting in MRMV. The online version of this article (doi: 10.1007/s00439-014-1475-8) contains supplementary material, which is available to authorized users. We wish to thank the family members for their willing participation and cooperation with this study. This research was supported by a grant from the Canadian Institutes of Health Research (#MOP-102758), and by the Pakistan Higher Education Commission (HEC). We declare that the authors have no competing interests for this article.